Wahoo World is a multiplayer stage in Splatoon 2. It is designed after an amusement park. It features a large rotating platform in the center of the stage, as well as extending and retracting bridges. Wahoo World is a stage based on an amusement park. The layout of the stage is primarily divided into three overlapping circles. On each end are the circular area where each teams' Spawn points are, located at the highest point of the map. This area is comprised on many layers, some inaccessible to the opposing team, while others are. To the right is a ramp which which connects the lower and middle ground. The main feature of the map is the large rocket ride that comprises the center circle of the map. While the rocket ride itself is inaccessible, the area around it at ground level is and will spin clockwise with two arches across from each other, with the side that is not facing the direction it is going will be inkable. There are two bridges that extend and retract on the top level. It follows a pattern of beginning to extend or retract every 30 seconds. When ever the bridge is extended, the central area will stop moving. To each team's right, there is a ramp which will lead to a glass bridge which is always extended to the area on top of the rocket ride. Wahoo World is an amusement park on a boardwalk. The stage is set on a part off of the boardwalk, surrounded by water. There are vending machines and trashcans to the right of the spawn, and maps of the park in front of it. The walls have various graffiti stickers plastered on it, and the ground is littered with confetti. The sides have a large sushi shop on the top level with jellyfishes as patrons, with the color of the shops determined by the current ink colors, being that the team's color is on their side's left. On the bottom level is a souvenir shop stocked with sushi-based merchandise. The bottom of the center has a rocket ride being ridden by jellyfishes, surrounded by a glass wall, while the other side contains electric boxes and wires, also surrounded by glass. On the central platform on top of the rocket ride shows the "Wahoo World" logo. The top level has a LED sign that shows when the retractable bridge is going to extend out, with it showing a red 'X' when it is currently closed or retracting, and shows a blue sprite from Squid Jump when the bridge is currently out or extending. The turf is mainly wooden planks, with some of the ramps and the extending bridges being topped with diamond plate, with the bridges' pattern being arrows showing the direction the bridge extends. The distant background has several rides and shops. There is a pier directly behind one of the bases with food vendors, with one of the shops topped with a retrofuturistic rocket, while the other side has the roller coaster wrap around it. The boardwalk has many colorful tents, a jellyfish performing a juggling act, a drop tower, the start of the roller coaster, a carousel, and a Ferris Wheel. Several palm trees are grown on the boardwalk, and various speakers are visible. The Splat Zone is in the center, with the zone being circular above the rocket ride in the middle. The moving platforms in Turf War stay open allowing for easier mobility. The Tower is located at the center of the map on top of the rocket ride. The tower will travel diagonally left and descend straight down in the air to ground level. It will then follow through the narrow hallways on the left up into the enemy base where it will reach its destination. The first checkpoint is located immediately once the tower has descended to ground level. The second checkpoint is located just before the sloped hallways that leads deeper into the enemy territory. The third checkpoint is located just after the sloped hallway and immediately to the left of the final goal. The platforms that move in Turf War acts like it does in Turf War. You can jump off the pedestal to place the Rainmaker to directly reach the enemy spawn point. The moving wall platforms have a hole on the walls, making it easier to reach the other side. The basket starts to the left of the spawn point, and the moving platforms behave like they do in Turf War. Wahoo World was released on 1 June 2018 at 02:00 UTC.. Shooting Clash Blaster Neo in Wahoo World. A match at Wahoo World during Fam vs. Friend. Eight players wearing the Fresh Fish series hiding in Wahoo World. Wahoo World was previewed on 8 March 2018 in the Nintendo Direct at 16:00 UTC and was announced to be released at the start of June 2018. 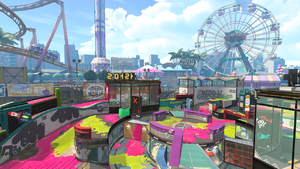 The Inkling language logo for Wahoo World seems to spell out "Smeshi World", which is the stage's name in Japanese. Wahoo comes from the fish of the same name. It is also an expression of excitement, suggesting the park is an exciting experience. The internal codename for this stage in the game files is "Carousel". The Dutch translation of the stage dialog reveals that the Fresh Fish is the mascot of the park. Sumēshī wārudo Vinegared Rice World. A parody of (Kamogawa) Sea World. French Parc Carapince Park + portmanteau of Carapace, "shell" and Pince "(crab) claw"